Once you download or load the browser version of the software you will click on the join now link below the login box. Next you will find yourself at a screen similar to the picture below (click to enlarge). Choose an account name and enter your email address. Choose a password that is easy to remember, but not so easy that other will be able to guess it. Try to include numbers and capital letters as well. 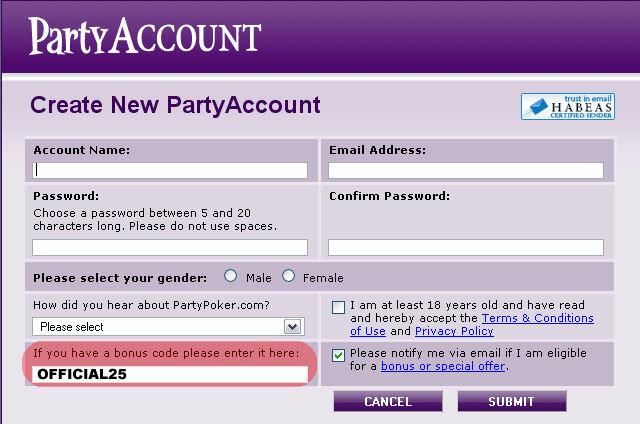 Be sure to enter the Party Poker bonus code you would like to use to claim your deposit bonus. Use PPAL500 for a 100% bonus up to $500. To deposit simply go to "Cashier" at the top of the screen and select "Deposit". Select your preferred deposit method and follow the instructions. Depending on what country you live in, you may or may not be able to use a credit/debit card. If the credit card or echeck option does not work for you try NETeller or FirePay. They are great alternatives and are pretty fast deposit methods. Finding a real money game on Party should be fairly easy even at peak hours. You can filter the games you are looking for by clicking on the game type in the tree navigation at the left of the lobby. Once you find the right game you can then double click on the table you would like to play at. A good tip is to check the white box in the top right that says "Hide Full Tables". By doing this you can avoid the hassle of always clicking full tables by mistake. You will find that the games are sorted quite nicely at Party Poker. The cash games are divided by game type, and the tournaments are divided by tournament type. For example you won't find any stud cash games in the limit hold em section. Be careful when selecting tournaments because you will find stud tournaments mixed in with hold em tournaments. It is always a pain to realize you are playing in a 7 card stud tourney when you wanted to be playing in an Omaha Hi/Lo tournament. Withdrawing Money from your Party Account. Withdrawing is similar to depositing. Simply click on "cashier" followed by "deposit". You will find that your withdrawal methods are limited to checks, echecks, NETeller, or wire transfer. Be sure that all of your personal information is accurate and matches the personal information supplied when you deposited. That concludes our Complete Guide to Playing for Real Money on Party Poker. If you want, you can find a full, detailed Party Poker review which includes types of games offered and tournaments as well as many other great features here.